What a great family tradition! 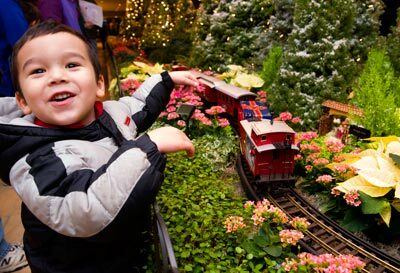 Wonderland Express appeals to everyone: kids love the trains (and the indoor snow), adults love the city sites and sights (and the indoor snow), and everybody loves the lights! We’re looking forward to seeing you there. Anticipation builds quickly at the Lake Cook Road entrance as you catch sight of the trees twinkling with white lights. Sparkling (LED) bulbs illuminate the trees on the path to Wonderland, including the 40-foot-tall concolor fir tree on the Esplanade. (The tree arrives by helicopter.) LED bulbs are small and energy-efficient, greatly reducing energy consumption (LEDs use 70 percent less energy) while looking ultra-bright and festive. Lighting your way through the Heritage Garden are seven Cornelian cherry dogwood trees, lit in red and white, plus a regal concolor fir at the central fountain. Glowing holiday trees in handsome wood-box containers stand at the porticoes and bonsai courtyards as you reach the Regenstein Center. (Our prized bonsai collection overwinters in climate-controlled quarters at the south end of the Garden). 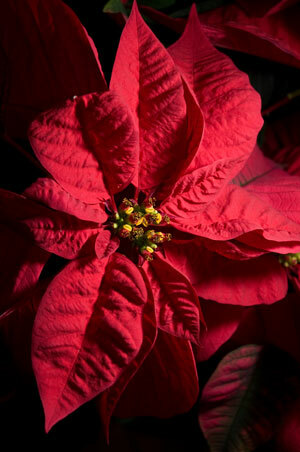 You’ll enter the Regenstein Center through the Greenhouse Galleries, where poinsettias are on display. Feel free to tour the three indoor greenhouses—tropical, semitropical, and arid—all heading toward peak bloom during Wonderland Express and the winter months. Chief among the reasons to visit the greenhouses in winter: they’re always warm (not to mention fragrant and filled with unexpected flowers)! In the Tropical Greenhouse, eight slow-growing spindle palms, wrapped with white lights, line the entrance; poinsettia spheres in assorted colors draw eyes and camera flashes. The Semitropical Greenhouse surprises with blue hydrangeas. Here, children like to search for the topiary animals (dragonfly! teddy bear! flamingo!) hiding among the greenery. 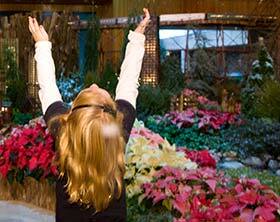 Head into the Arid Greenhouse, too, for baskets of kalanchoe, Christmas cactus, and burro's tails. As you enter the first room of the exhibition, take delight in a whimsical gingerbread village that helps make this holiday season so merry and bright. As you enter Nichols Hall, trains pass high and low, appealing to railroad enthusiasts of all levels: for little ones, there’s Thomas the Tank Engine; more experienced rail fans will recognize the only-shown-at-Wonderland Express cars and engines from our 300-to-400-strong train car collection. And, of course, there are the plants! 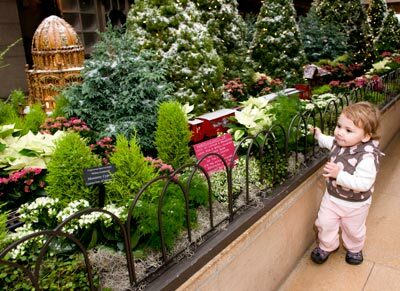 Gardeners will be awed by the many dwarf and mini-conifers that landscape the “city.” Interspersed with poinsettias and other small-by-nature plants, the evergreen landscape is a tour de force of weeping, creeping, mounding shapes—all punctuated by snow falling silently from above. It's the city of Chicago...In Miniature! Adults marvel like kids at the unbelievably detailed replicas of more than 80 of Chicago’s most famous buildings and landmarks. Handcrafted by railroad garden guru Paul Busse and his crew at Applied Imagination, the buildings are all constructed of natural materials: gourds, pine cones, bark, acorns, pods, seeds, grains, grasses, and other creatively-used bits of nature. All of your favorite Chicago sights are there: Frank Gehry’s band shell and Anish Kapoor’s Cloud Gate (the “Bean”) from Millennium Park…the South Shore’s Cultural Center and Frank Lloyd Wright’s Robie House…Soldier Field and the Navy Pier ferris wheel…and the spectacle of Michigan Avenue, as exciting in miniature as it is life-size. And did we mention the waterfall that feeds the “river”? In Krehbiel Gallery, you’ll stroll the local landmarks of the North Shore, which the Chicago Botanic Garden proudly calls home: Baha’i Temple…Writers Theatre…and the just-outside-the-door landmarks of the Garden itself. Ready for a break? The Garden Café, the Whistle Stop Café, and a pop-up Garden Shop are popular gathering spots for relaxing with a cup of cocoa or shopping for fun, train-related gifts. It’s one of our most frequently asked questions: is the snow real? Yes and no. It’s 99 percent water, plus a bit of vegetable oil. (It’s OK to stick out your tongue for flake-catching). It evaporates, it isn’t cold, and, so far, no one has figured out if every snowflake looks different. 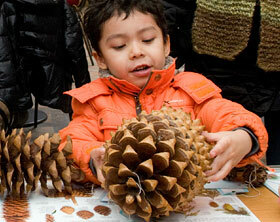 On weekends, Family Drop-in Activities keep kids active and engaged—check out the schedule of activities here.